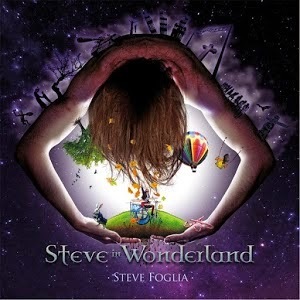 Self-produced by the main man himself (with the always reliable Atomic Stuff Promotions stepping in to lend a helping hand on the PR front), "Steve In Wonderland" is the second solo release from seasoned drummer/professional instructed Steve Foglia. Serving as the follow-up to 2011's highly-regarded "Revenge" (a concept album based on the legend of "Angst"*, "Revenge" found Steve working with the likes of Adam Bomb and one-time Yngwie Malmsteen/Loudness member Mike Vescera), "Steve In Wonderland" features eleven (70's/early 80's-inspired) classic rock/hard rock songs including a righteous cover of the well-known & well-loved Grand Funk Railroad hit, "We're An American Band"! Opening number "Fight for Justice" features guest vocals courtesy of Blaze Bayley (Wolfsbane/Iron Maiden) while Simone "Seth" Borsellini (singer for Sfregio and Fumonero bands) and Francesca Foglia guest star on "Enemy's Collection" and "Walking in Wonderland" (a sweeping eight minute plus number that recalls the heyday of AOR!). Meanwhile Rakel Traxx guitarist Zantolo offers up his skills on "Wrong Hole", a sleazy, seventies glam rock-infused, Hanoi Rocks meets (early) Great White (while Carlos Santana stops by a visit and a sweet and tasty solo!) number that is just too good for words! Otherwise the line-up for "Steve In Wonderland" includes vocalist Johnny Idol, guitarists Federico Mineva & Daniele Arieta, bassist Maurizio Dedoni (Alessio Menconi's bass player) and keyboardist Edoardo Tavanti. Naturally Steve Foglia (also of Jennifer Scream's) handles all the drums and percussion on his second solo outing and thanks to the mastering job of Dario Mollo (The Cage, Tony Martin, Voodoo Hill, Glenn Hughes) every minute that passes of "Steve In Wonderland" finds the listener pulled further and further into this time-stamped picture of hard rock perfection! Just going by it's vintage finish (one which gives "Steve In Wonderland" a remarkably classic vibe!) this a surefire winner for fans of classic rock of old or the seventies' hard rock scene. Whether it's original gems like "Few Days to the End", "Love's Gate" and "Numbers" or even Steve's respectful cover of "We're An American Band" there's not a single moment on "Steve In Wonderland" where something feels out of place. Songs like the rugged rocker "Numbers", "Enemy's Gate" (arguably the heaviest cut here this one almost sounds like Alice Cooper cooperating with Black Sabbath in order to make seventies hard rock sound as wicked as possible! ), "Loves Gate" and "Club 27" (a track which references the numerous musicians who died at 27**) all gel together as Steve's second solo release glides about carefree and natural! Everything that was right about yesterdays' hard rock, glam rock and AM rock and roll is given an uplifting makeover in order to reflect Steve Foglia's personal love for the music and artists that inspired him. For this Italian drummer (and the all of the additional musicians who lent their time to the worthwhile cause that was the construction of Steve's solo album number two) every number here just springs to life! From heavy rocker "Fight for Justice" to "Eternal Last Day" every song has the heart and soul of yesteryear's music. You can hear as much on "Eternal Last Day" thanks to it's official video provided below for your viewing enjoyment! ), but to think that is just one moment for Steve and company! Thanks to it's wide range of influences (Alice Cooper, Led Zeppelin, Deep Purple, Whitesnake, Foghat, Rolling Stones, Faces, Kiss, Quireboys, etc.) and the commitment of all involved, "Steve In Wonderland" is just too good not to be shared with fellow music fanatics and collectors alike! "Angst"* is a famous abandoned hotel in Liguria, Italy, next to the French border. **Jimi Hendrix, Janis Joplin, Jim Morrison, Brian Jones, Kurt Cobain, etc.